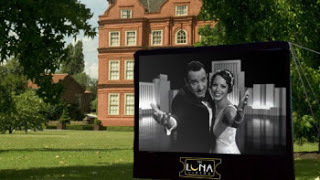 On Thursday I went to see an open air screening of The Artist at Kew Gardens, with my friend Sarah. Luckily for us it was a lovely evening and so we arrived early to have a picnic before the film began. Of course everyone else had the same idea, and we were surrounded by the sounds of popping corks and pleasant chit chat as people munched on their picnics and free samples of Davidstow cheese. I had planned to make a quiche and some cupcakes for the occasion, but I forgot to buy icing sugar and Sarah made it clear that she is not a fan of cooked eggs in pastry, so I had to think again (or eat a lot of quiche). For some reason I was reminded of a favourite lunch from years gone by when I was a frequent visitor to Totnes in South Devon. There was a lovely tea room on the high street that sold simple but delicious lunches, one being a generous slice of homity pie. There are no eggs involved, so this sounded perfect for a picnic with Sarah. A homity pie is a open wholemeal pastry tart filled with potato, onion, cheese and not much else. I had always thought of it as West Country dish but it seems that it may have been created by the Land Girls during World War II, when rationing meant that there was little food available other than that grown in the surrounding fields. 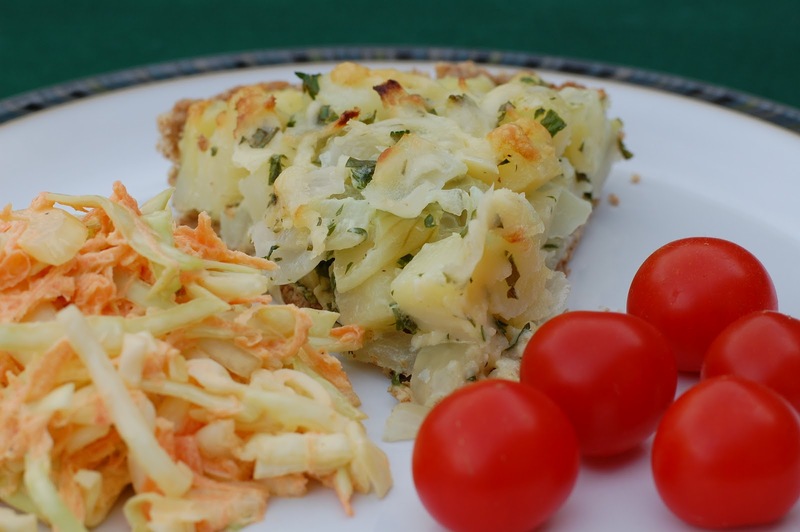 The only place I had seen homity pie served other than the Totnes tea room was in Cranks in Covent Garden, so I found their recipe on line. Coincidentally, Cranks have now closed all of their restaurants other than the one in Dartington, near Totnes, so I still have a long way to travel if I want to buy homity pie. I made a few changes to the recipe (and so have published it below), and was very happy with the end result. This is a simple dish, but surprisingly tasty and not difficult to make. I will definitely be making this again. Begin by making the pastry. Mix the flour and baking powder together, and rub the butter and vegetable fat in until the mixture resembles breadcrumbs. Add just enough of the iced water to bring the mixture together, then shape into a round. Wrap the pastry in clingflim and chill in the fridge for 20-30 minutes. Next, boil the diced potatoes until just cooked. Then rinse under cold water and leave to cool. Gently fry the onions in the oil and butter until soft, but avoid browning. Just before removing from the heat add the garlic and fry for a further 3-4 minutes. Leave to cool. Roll out the pastry and line a 20cm flan tin. Prick the base with a fork and chill for a further 10 minutes. Line the base of the pastry case with tin foil and fill with baking beans or rice. Cook at 180 degrees for 12 minutes, then remove the foil and beans, and bake for another 5 minutes. 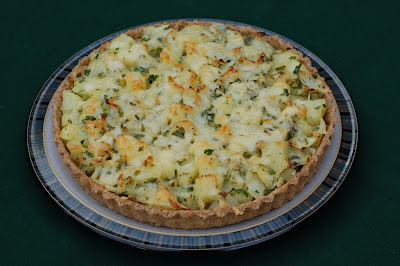 Meanwhile, mix the cooked potatoes, onions, chopped parsley, creme fraiche and half of the grated cheese together. When the pastry case is ready gently press the filling into it, trying not leave any gaps. Sprinkle the remaining cheese on top and bake at the same temperature for 20-25 minutes. Sounds really delicious – great for a picnic. I have eaten homity pie in the past but I can't remember where, although I've made quite a few visits to Cranks in London and in Dartington over the years so that may be the answer. I had no idea that it was invented during the war, though. 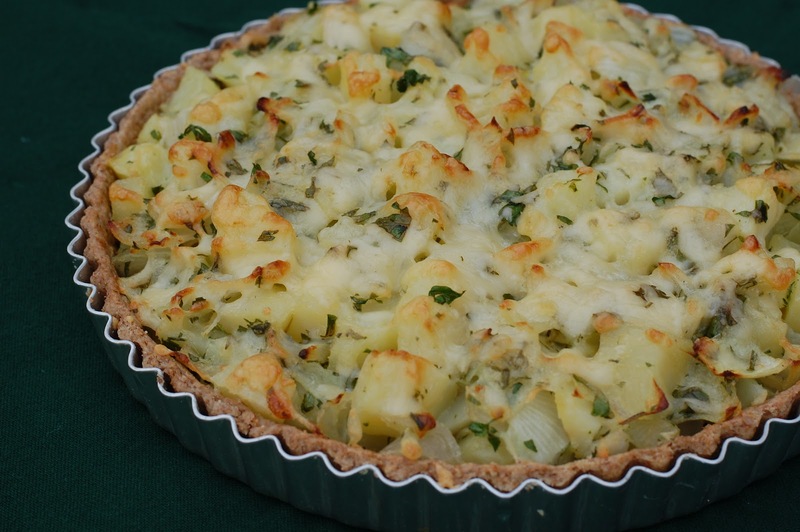 A fab vegetarian recipe there Lucy – it looks suitably manly enough to feed to Matthew! I reckon I might try using leeks instead of onions as we have managed to grow some at the allotment. Mmmm roll on a weekend lunch to scoff it at! I think it was just a run of three evenings, but you should look out for it next summer.